This stunning contemporary marble board makes a perfect cake plate for weddings or cheeseboard for special anniversaries. 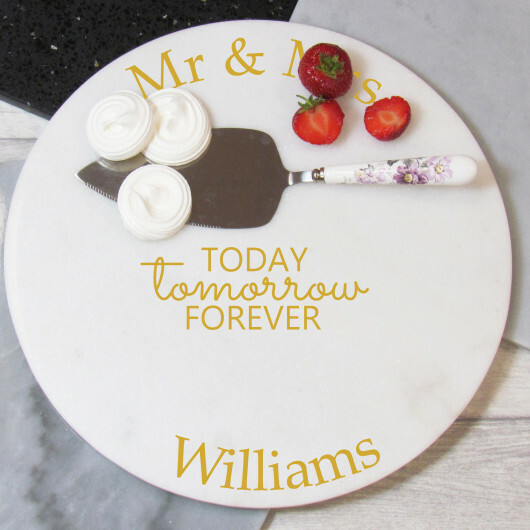 The marble cheese board is engraved with Mr & Mrs and the slogan Today Tomorrow Forever. You can then add a surname to personalise the board we then hand decorate with gold, the board is food safe and dishwasher friendly. Make your marble board even more special with a black gift box, with black shredded tissue paper and finished with a black satin ribbon at checkout to make this a truly beautiful gift.